As usual with a big fall you can analyse the overnight news and debate whether the drop is warranted, but when it comes to a free market that rides on sentiment the answer is not whether the market should fall 274 points because the National Economic Council director is going to resign, but what put the market in a position that such a mild piece of news could have such a big impact. A waterfall starts with one drop, but it’s no good examining the drop and saying today's fall is unjustified. You have to respect the buildup of water that created the pressure that forced out the first drop. That's the real cause. The US market is up 13.6% since Trump’s election, that means the S&P 500 has added US$2.66 trillion in value (and that's just one index), on hopes that his pro growth agenda including infrastructure spending, reduced regulation and tax reform, would push up the earnings of the index constituents (the "E" in PE) to justify the rise in their price (the "P" in PE). 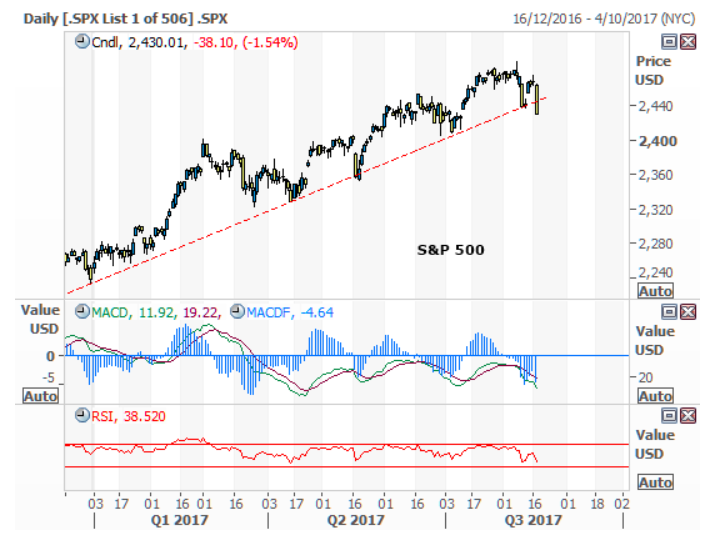 The debate is not whether Gary Cohn resigns, the debate is whether stock market prices in the US have anticipated too much. In which case the fall overnight is not about Gary Cohn, it’s about the pressure built up by a market on a P/E ratio of 17.8x in anticipation of something (Trump's agenda) that may not now happen. You can understand how the market can hiccup. The market is not a science, it is a reflection of human sentiment and it's mood can do anything at any time. The herd does tend to react to a strong lead (like a big one day fall in the market) and head off in that direction. It is not logical or sensible at all times, it is led, by momentum. The momentum may have just turned, and that alone, not Gary Cohn, is what you should fear, if anything. Understand that none of us know whether this is a one-day aberration (like the North Korea drop at the end of last week) or the start of a new downtrend, so don’t go looking too hard for an emphatic, binary, Yes or No answer, because there isn’t one for everyone. You simply have to choose from your own point of view whether you are going to react to a possible top in the market or whether you really don’t care because you have your eye on the horizon. You will find a lot of conflicting messages today depending on who you are talking to. The talking heads on the media speak daily and react by the second. They will, as usual, paint a picture of disaster and then tell you that they sold yesterday. Tomorrow they will be over-reacting to the next event. Longer term investors will be telling you to focus on the horizon and do nothing. But you have to choose where you are within that range of time frames and act accordingly. For me, I watch the market so closely that I can afford to sell something because I am going to be there every day looking for the moment to buy it back. But it doesn't mean you should. If you only pay cursory attention to the stock market then this minor fall is nothing to worry you. It is a bad week in a bull market, no more. Your game is to avoid a major global financial crisis, not sell and buy and sell and buy. You only sell when there is a seismic fundamental event, not a one-day sentiment glitch. So go about your business. For the rest of you daily followers of the market, yes, you might sell something in case this is the start of a correction in a bull market. You can always buy back tomorrow when the market bounces. Cheap insurance - With commissions on trades so tiny these days paying $19.99 to sell and $19.99 to buy back is not an expensive insurance, it is $39.98 well spent if you sleep soundly tonight and wake up tomorrow morning looking forward to the weekend rather than fearing the market on Monday. I can only speak for me. You have to act for you. A lot of common sense here. Only other comment I'd make is that if one is looking at a chart for sentiment, it pays to know what part of the market the chart is representing. The S&P 500 largely shows the sentiment towards the FAANGS. A more broad based chart, such as the Russell 2000 can, and currently does, show a somewhat different picture.